2003. Robin Brailsford, Hillview Medical Center, Pacoima. The project budget: $48,000. Commissioned through the Los Angeles Cultural Affairs Private Percent for Arts Program, this project consists of 137 square feet of glass, gold and porcelain tesserae mosaics for reception areas of mental health outpatient facility. The client was taken with the single Yuzen mosaic pavers Brailsford created for the transit mall in Santa Monica. They requested three "carpets" of richly grouped and patterned mosaic. 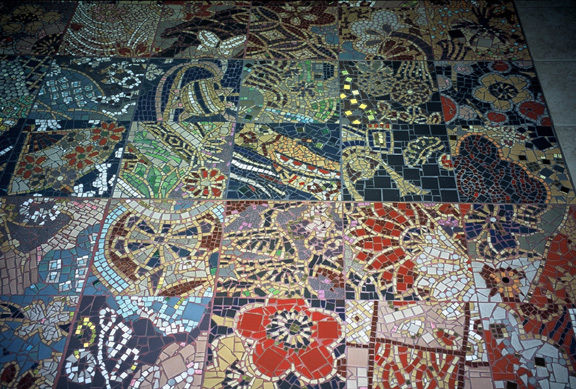 Located in the waiting areas of the facility, the mosaics invite close inspection and flights of imagination. Photograph courtesy of Robin Brailsford.